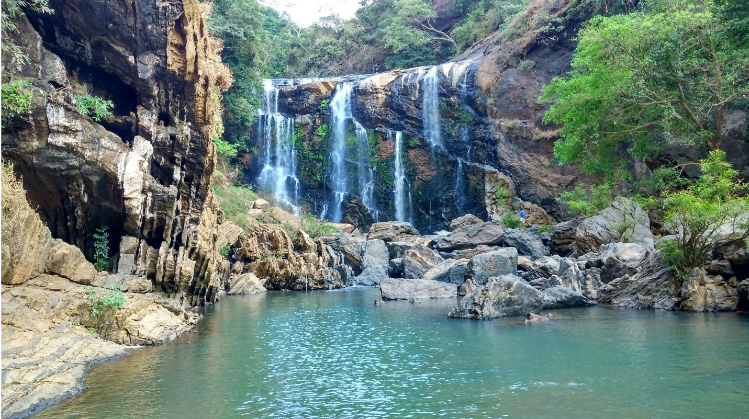 Sathodi Falls : Tranquillize yourself in the lush green environment. Waterfalls make for a great view and nowadays the busy schedule of people is subsiding them from nature’s love. It’s just seem impossible for any individual to resist getting into a flowing stream or stand under that rigorous force of water pouring down from a height. Sathodi Falls is formed by several unnamed streams near Kallaramane Ghats, Uttara Kannada District, near Yellapur, Karnataka, and 32 km from Yellapur. It is about 15 metres (49.2 feet) tall. The stream then flows into the backwaters of the Kodasalli Dam, into the Kali River. Sharing my experience to this falls, it was a road trip and we just strapped our bag packs and left for one of the most adventurous bike rides. At that time my location was Hubballi. The on-route travel experience is amazing and breathtaking and it will surely bring the shock & awe expression on your face. And trust me it will be better if you are riding your own vehicle because this place is not well explored so the transportation facility is modest. This untouched waterfall resides in the laps of nature covered with lush green forest. The water flowing is pure and unpolluted. It comes down hard on the rocks resulting in moist and damp air. But this hard hitting of waters and frogs croaking added a great tune for nature lover. There are rocks all around varying in their size and below this bed of rocks lies a small pool. The scene indicates the purity of nature when not ravaged by human habitation. But with all those pros there are surely some cons as well. To explore its inner beauty you have to struggle a bit because the condition of the roads is unacceptable and it becomes worse during the monsoons. So it’ll be great to avoid this place when monsoon is hitting hard. As this waterfall is not explored much, thus whenever you plan a trip to this falls be packed with your stuffs (food and water) because you won’t find any restaurants or cafes nearby. This greenery of nature will surely touch you deep and uplift your feelings. Also you will get time to comfortably sit and daydream as you won’t find cellular networks to get you connected to the outside world. It was overall a wonderful experience and the noise subsided as we walked away. 10 Amazing Street Foods In Dubai That Are Must Try!